‘Daleks Among Us’ wraps up the fiftieth anniversary season’s Seventh Doctor trilogy, bringing to an apparent close the Elizabeth Klein and Will Arrowsmith era in the process. Unfortunately, the end result is an overly long story that revels in exposition rather than drama, requiring its listeners to have a firm grasp on the history of both Klein and Davros as well as of the current story arc, and even then it seems unsure of what type of story it wants to be and what its focus truly is. To be fair, there are some intriguing ideas in play that create a fascinating backdrop for the events portrayed here. The Lemurian culture being so obsessed with punishing criminal wrongdoing that it compiled all of the universe’s criminals’ DNA, only to take so long doing so that the remnants of their culture must exact punishment against the original criminals’ descendants is an intriguing concept. So, too, is the erection of a statue of Ace after intimated events in which she was instrumental in the freeing of colonists on Azimuth from alien enslavement. After a bevy of exposition, ‘Daleks Among Us’ seems uncertain about which plot it wants to follow. There comes a point where the Persuasion device, the very driving force of this entire trilogy, is essentially tossed aside to instead focus on Azimuth and Klein. Sadly, even the Daleks’ plans for the device when it is mentioned are needlessly generic since they see it as just another means of convincing people to kill themselves or die. The fact that the story is so reluctant to do anything new with the most iconic foes of the franchise is its biggest weakness, offering little excitement or terror as familiar ground is retread over and over again. Even placing the Daleks in the same place as Nazis to draw blatantly obvious parallels before the Daleks again show their true colours is rather uninspiring, and while Davros being a prisoner of the Daleks without realizing it is clever, placing him into the role of unsuspecting victim isn’t the strongest use of the character. Unfortunately, just as the previous two stories have seemed unclear of just what they want to do with Klein after her previous trilogy showcased the natural conflicts of a Nazi travelling with the Doctor that would arise and then UNIT: Dominion highlighted what her life was like after such a dramatic change within the context of those adventures, so, too, is ‘Daleks Among Us.’ Instead of doing something new with the character that would give reason to bringing back such a unique presence, she is instead haphazardly made out to be a clone who was specifically engineered in order to operate the Persuasion device. Worse still, the revelation that Kurt Schalk is her father feels completely unearned and more like a convenient and untidy way of tying these stories together. Klein was a character who underwent a beautiful character arc under Big Finish, but the events here severely undermine everything that came before it. 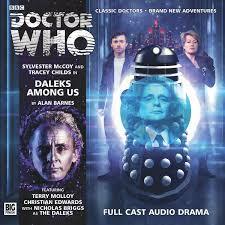 With Davros hardly at his most commanding and Will Arrowsmith likewise undergoing no development to explain just why he was brought aboard the TARDIS other than to be another body, ‘Daleks Among Us’ is hardly the concluding piece of the trilogy and monumental cornerstone of the fiftieth anniversary season it so desperately strives to be. There are some intriguing concepts alongside solid pacing and sound design, but there are just as many concepts and characters that completely fall flat. ‘Daleks Among Us’ tries to do far too much, creating false conflict as it unsteadily dives into continuity and jumps from plot point to plot point without thoroughly exploring any of them.